Calendula officinalis flowers are infused in an apricot kernal oil base for at least one month. We make our Calendula infused oil in small batches and add a touch of Vitamin E to guarantee freshness. Calendula infused oil is one of the most gentle and nourishing oils for the skin. Calendula officinalis flowers are a wonderful herb for soothing irritated skin and expediting the healing process. It would be a valuable addition to any body product that repairs damaged skin. It is a mild yet effective oil that is deeply nourishing and gentle enough for children and babies. Use this oil as a stand-alone moisturizer or as an ingredient in a lotion or salve for an exceedingly nourishing product. 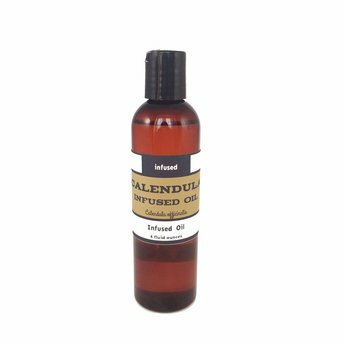 Calendula oil has an orange color that will tint any body products it is added to. None known. For external use only.